As a Property Manager at Liberty Property & Asset Management, Ms. Ware is directly responsible for overseeing the day to day operations of many of the properties in the company’s portfolio. She has over 21 years of experience in the commercial real estate arena and she is known for maintaining outstanding relationships with clients, tenants and contractors. Ms. Ware is extremely proficient in the preparation of lease documents and in contractor/vendor negotiations. Ms. Ware has a Bachelor of Science from Central Michigan University and an Associate of General Studies from Oakland Community College. 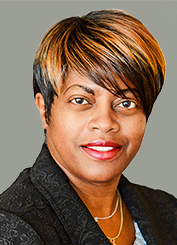 She is also a Notary Public, has certifications in Property Administration and Facilities Management from Building Owners and Managers Institute International (BOMI International) and is a member of the Building Owners and Managers Association of Metropolitan Detroit (BOMA).